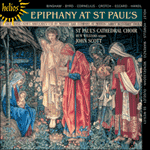 When to the temple Mary went, by Johannes Eccard (1533–1611), is one of a host of motets by foreign composers which were supplied with new words in the nineteenth century. In this case the text is by the Reverend J Troutbeck, who produced operatic translations and worked with both Stainer and Frederick Bridge on various Hymnals and Psalters. Troutbeck is best remembered for his lasting translations of Bach’s St Matthew Passion, St John Passion and Christmas Oratorio. Eccard was a chorister in the Kapelle of the Weimar court from 1567 until it was disbanded in 1571. He then went to Munich to sing in the Bavarian Hofkapelle, where he also studied with Lassus. He served in Augsburg and in 1579 at the Hofkappelle of Margrave Georg Friedrich of Brandenburg-Ansbach, later becoming vice-Kapellmeister. He was appointed Kapellmeister in his own right on the accession of Joachim Friedrich as Elector in 1604. Eccard’s music is frequently scored for more than four voices—here the setting is in six parts. His music thus sounds rich and sonorous, the inner parts having their own melodic and rhythmic logic. This type of piece is known as a ‘chorale-motet’ and such works are characteristic of the seventeenth-century Protestant composers. As it had been revealed. The hope of Israel, the light of men. May gently fall asleep and with thee wake.